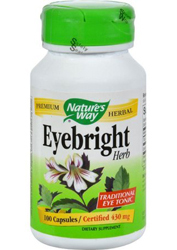 Eyebright Herb by Nature's Way, (Euphrasia stricta) has been used traditionally to support eye health. Ingredients: (Per Serving) Eyebright (stem, leaf, flower) 860 mg.
Other Ingredients: Plant-derived capsule (hypromellose), cellulose. Suggested Use: Take 2 capsules daily. If pregnant, nursing or taking any medications, consult a healthcare professional before use.